Long an annoying meddler in Latin America, Iran hits the jackpot. The film is shaky, out of focus from the hidden camera but the meaning is clear. Iran operatives want locations and access codes to U.S. nuclear facilities. A representative from Venezuela wants a certain general in Caracas cc’d with that, por favor. Latino network Univision aired clandestine video from a series of meetings that resulted from a “gift” – a proposition on the part of the Iranians to what fortunately (or unfortunately) was a Drug Enforcement Agency (DEA) informant in Mexico. In deep cover, the informant had the gift dropped in his lap and passed it on up where it and other wish-list projects like help managing a messy bombing of the Saudi Ambassador somewhere in Washington D.C. were caught on a concealed camera. 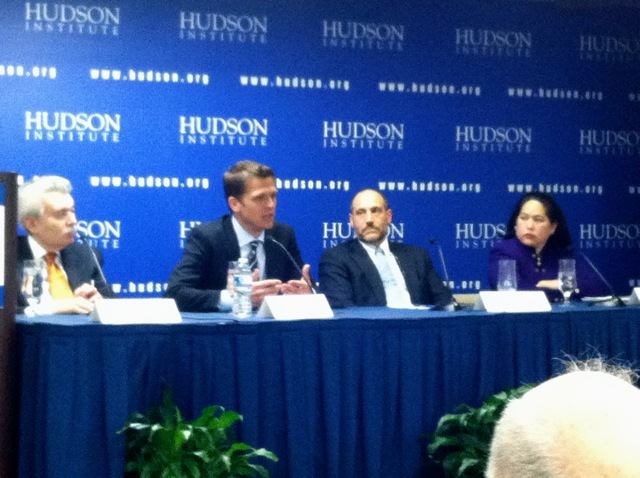 I was at the Hudson Institute’s forum “The Iranian Threat: Latin America” viewing the video clips among a rapt audience. A panel of experts would be lending expertise and analysis shortly to expand on the incriminating evidence of just how reckless and dangerous Iran’s behavior really was. Iran has built relationships with the Bolivarian nations of Venezuela, Ecuador and Bolivia as well as some Caribbean nations, and Cuba. These are secretive and strategic relationships, which experts label as “not real” in that “trade” deals are not really about trade, but symbolic finger-in-the-eye polemics that largely involve few or no genuine tons of ore or of truck engines. Venezuelans travel to Iran for “training” then meld back in to society for who knows what purpose? These murky interactions lie at one end of the spectrum of Iran’s ties on the continent. At the other end is Brazil, which while not driven by counting ideological coup on United States hegemony, is Iran’s biggest trading partner in the Western Hemisphere. That relationship is more about money and products; with Iran’s supply chain severely strained from sanctions and Brazil happy to export finished products and raw materials. This is what we’ll call “real” trade. This entry was posted in Petroleum Planet and tagged Aqua Bounty Technologies, Community Studies, current events, falkland islands, falklands, gulf oil blowout, hormuz, iran, malvinas, Mohawk, Native American In The City, Petro-Politics, Stuxnet, thatcher, U.K., war, Washington DC. Bookmark the permalink.